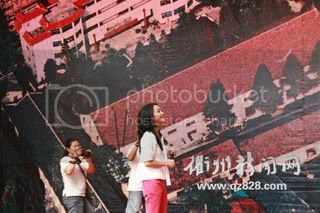 The third Zhejiang tourist festival takes place from Sep 11th to Sep 13th in Cu Zhou city, Zhejiang, China. It was reported Zhou Xun would come back hometown and attend the festival as an ambassador. She would appear in the opening ceremony, join tour and visit local schools. Thus, when the festival is coming, there was an activity in Chu Chou got many people's attentions:"It's free to enjoy the Movie Queen Jue's wonderful performance in her movies". It started with showing Ming Ming. Because the movie tells about modern love story, the majority of audiences were young people. Besides watching movie, they ebulliently discussed Jue's movies and her coming back here. It was said that this activity would last 3 days. After Ming Ming, her latest movies, The Banquet and Perhaps Love would be respectively shown in the following evenings. 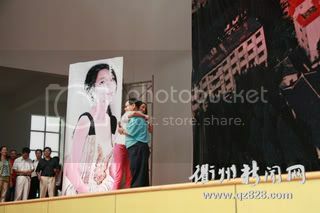 As the schedule, on Sep 11th, Zhou Xun came back Chu Chou and visited Chu Chou school. 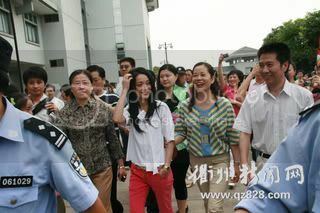 In the morning, atmosphere at the stadium of school was very noisy because hundreds of students gathered to welcome her. About 10.30, as soon as appearing, Jue was surrounded by many teachers and students and received fresh flowers and garlands from them. 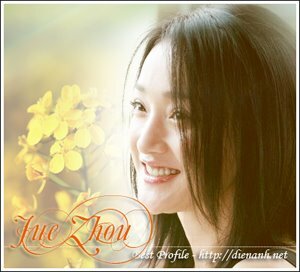 In the meeting, Zhou Xun was so surprise and happy that she cried because some her old friends also came here. Not only singing the song "watching sea" as a present for everybody, but also Jue encouraged students in study and sent best wishes to school. The meeting only lasted 30 minutes but gave everyone, Jue, teachers as well as students, strong impression, an unforgettable memory. Let's see Jue's pics at Chu Chou school.